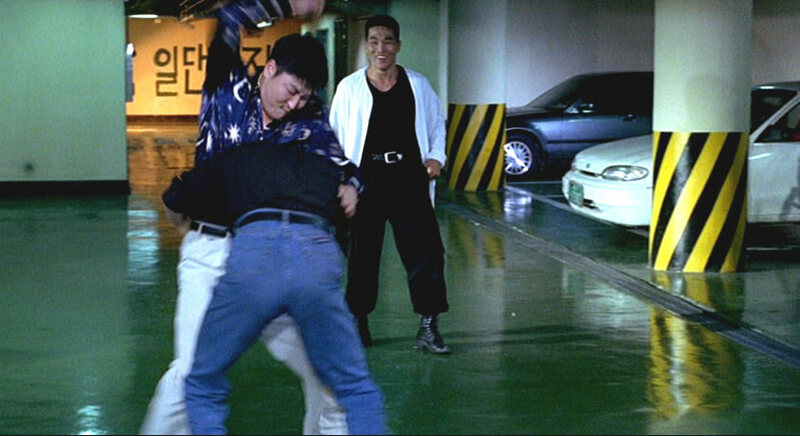 Lee’s first film, Green Fish (1996), incorporates family melodrama into a realistic crime film. Lee’s first major success, Peppermint Candy (1999) continues his interest in studying human emotion within a distanced style. Oasis (2002): another Lee melodrama without conventional spectacle. A long take two-shot of mother and son on the road to Milyang shows them enjoying the natural environment. The opening credits indicate their long road trip from Seoul to the margins of the Korean nation. Following the credits, Shin-ae is shot from behind as she enters the provincial town. The camera holds back to frame Shin-ae and Jun in two-shot. ... Shin-ae presumptively suggests to the owner that she make decorative changes. The negative connotations still associated with the term melodrama are due to these anti-realistic elements of sensation, exaggeration, excitement, and emotion. 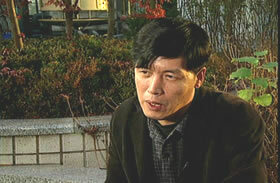 This dichotomy makes the films of South Korean writer-director Lee Chang-dong of particular interest. Lee has been acclaimed as one of the most realistic filmmakers of the New Korean Cinema even though he consistently uses melodramatic narrative forms. 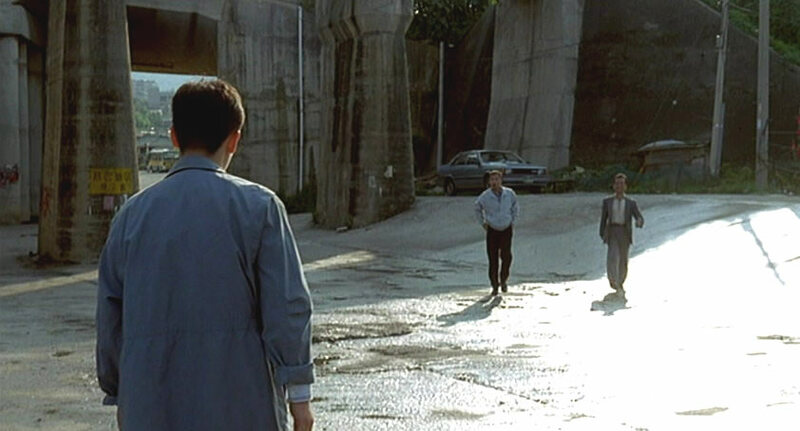 As film critic Kim Young-jin argues, Lee’s films have a “conventional melodramatic structure, but tend(ing) towards realism in style.” [open endnotes in new window] Lee’s fourth and most recent film, Milyang (Secret Sunshine) (2007) provides a rare contemporary example of a popular film (at least within its national context) that also manages to be of aesthetic and social distinction. This essay will offer a detailed formal analysis of Secret Sunshine in order to explore how melodrama and realism can interact to create and interrogate meaning in popular film form. In regard to this liminal status between melodrama and realism, Secret Sunshine is the most representative of Lee’s films to date. As will become clear, Lee’s background as a novelist and his resultant self-consciousness towards cinema serve to distinguish his movies from his contemporaries both in Korea and the rest of current world cinema. The fact that Lee was attracted to cinema because of its social utility explains his attraction to genre as a way of securing an audience within Korea for his work. Although Lee entered the film world by collaborating with director Park Kwang-su, his own work differs from his Korean contemporaries such as Park, Jang Sun-Woo, and Lee Myeong-Se. Coming to cinema after the first Korean New Wave (which begins in 1988 with Park’s Chilsu and Mansu), Lee began with more overtly political films characteristic of this generation. But his most overtly political drama, Peppermint Candy, with its unique narrative structure and use of melodrama, appealed to both international art cinema and Korean mainstream audiences. With Oasis and now Secret Sunshine, Lee has moved further towards mainstream visibility. In contrast, Park Kwang-su has not released a film commercially since his historical drama The Uprising (1999), with the exception of his contribution to the omnibus film If You Were Me (2003). Jang Sun-Woo has been inactive since the commercial flop The Resurrection of the Little Match Girl (2002). Even Lee Myeong-Se, who has remained the most active of the early New Wave directors, has not had a great deal of commercial success and no exposure abroad. His recent M (2007) did disappointing box office in Korea. Likewise, the newer auteurs of the second Korean New Wave (the so-called 386 generation), Kim Ki-Duk and Hong Sang-soo, have never had popularity within Korea. The only auteur with real commercial success and art cinema accolades would be Park Chan-wook, but Park works in the spectacle-filled action genre and employs a style devoid of any realism. When he moved away from this in his film, I’m a Cyborg, But That’s OK (2006), the results were less successful. Lee’s uniqueness is combining a style praised for its verisimilitude with a genre-based approach that appeals to domestic viewers. Thinking that this may be a key to some formal pattern, Kim then asks whether the shots get longer as the film progresses. Lee responds by stating that if the shots did get longer, it was purely accidental, reiterating that the film is really “normal.” This type of directorial self-deprecation and denial of meaning is common. Historically, there are many cases of directors who do not discuss their work in an aesthetically self-conscious way, most notably classical filmmakers such as John Ford. Artists are notoriously reticent about discussing their work, and it is tempting to dismiss these comments as just another example. When the viewer confronts Secret Sunshine, Lee’s remarks become even more incomprehensible, since it is anything but a conventional film. Nevertheless, I believe that Lee’s description contains a kernel of truth. The film contains a form that cannot be easily classified within the contemporary cinematic culture because of its very normality.